Nemausus. Offically cut dupondius of Agustus and Agrippa. Denomination : This started off as a bronze dupondius, but was cut in half to make it into two As. This type is common found cut this way, and ways between the two portraits, so it is pretty certain they were cut officially. Mint : Nemausus (modern day Nimes in France). Date : The exact date of the striking of this issue is uncertain. 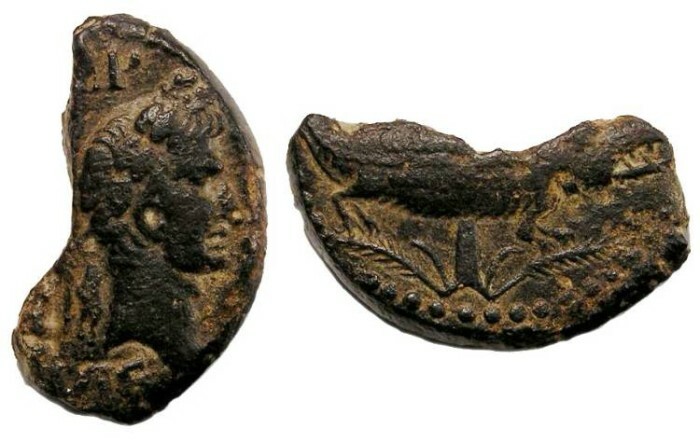 Some references say 10 BC to 10 AD, but Sear (Roman Coins and Their values) makes a case for it having first been issued in 28/29 BC but being struck continuously over the next 30 or 40 years. Reference : Sear-1728 (for the full uncut issue). Size : 25.3 x 14.2 mm. Weight : 4.45 grams. Grade : XF with a very dark brown patination (and lighter brown high lights). Obverse : Head of Augustus right with an P above and VI F below. Reverse : Crocodile right, with part of the palm tree visible below.